We’d better start with a couple of Disclaimers, with capital Ds. 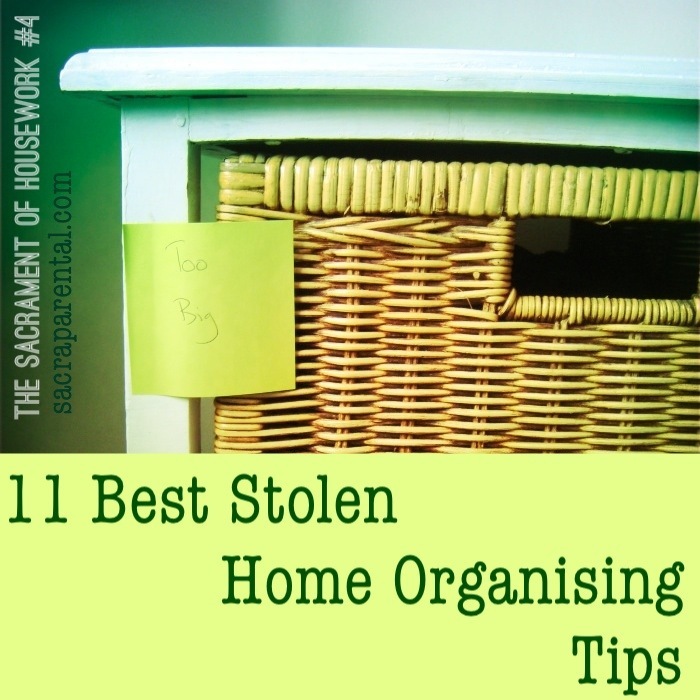 1: I write as an enthusiastic student of the art of home organising, not in any way as an accomplished expert. My bedroom floor is Exhibit A. 2: My house is pretty messy, most of the time. But it’s a much more organised messy than it used to be, and that does make a difference. Here’s why I (now) care about home organising, and why this is part of a sacramental series rather than a Pinterest post: having an organised home helps me follow Jesus better and join God’s work of making the world a better place. I want to invest time and thought in systems that save me time and money later. I want to use most of my headspace and energy on loving the people around me and changing the world for the better, rather than on finding lost socks and rummaging through four full drawers to find a container with a matching lid. I want to streamline our home so it can work, so it can help me do things like cook meals for people who could do with a break, and free up our time and money to spend on what we really value. Our mission as a family includes offering warm and simple hospitality to friends and strangers, and giving money and practical help whenever we see a need we can realistically fill. You might be familiar with the quandary we often face: our aspirations and our capacity aren’t always in the same place. That’s where the streamlined house comes in. It is a tool to help close that gap. Unexpected guests are daunting in a disorganised house (as I know well! ), but much less of a stretch in an organised one (as I happily now also know well). If the spare bedroom sheets, nice towels and a spare toothbrush are all handy and ready, it’s pretty easy to have a last-minute guest to stay the night. If the pantry and fridge are organised, we save money, waste less food, and can easily set another place at the dinner table (an extra can of chickpeas stretches most dinners!). If our clothing drawers are well organised I’m more likely to put away the clean washing in a timely fashion and feel like the house is more respectable for guests (and enjoyable for us). Anyway, you get the idea. Organising the house can be a meaningful, missional, sacramental activity – just like anything can. I’ve been lucky enough to have had 18 months without a permanent home to think about how I want things to run. Now I’m lucky enough to be settling into our own place, with all of our stuff out of storage, I’m getting lots of satisfaction out of putting into practice the various tips and tricks I’ve magpied from friends and the internet over the last year or so. Here are the things that have made it into practice in our house so far and I’ve found well worth the effort. Easily distracted when organising or tidying? Bring a basket or box with you to whatever room you are sorting out and put in it anything that needs to go out of the room. 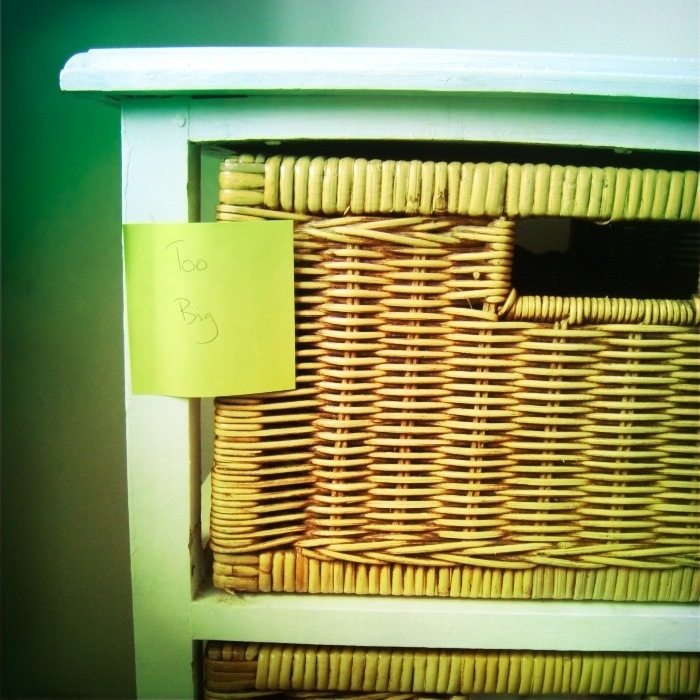 Wait until you’re finished in that room to take the basket out and rehouse its contents. 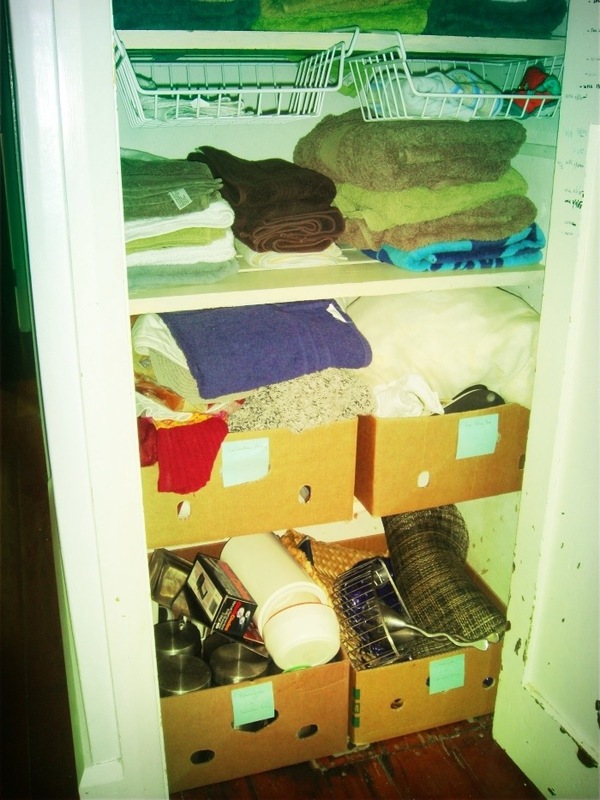 This is a genius idea I read on a few different decluttering sites, and it really did help when we were unpacking. Sadly some of those filled baskets are still full of random stuff, but at least they’re not on the floor, right? Do you have inquisitive toddlers in your house often? Reserve your most accessible drawers and cupboard shelves for things that are robust. After seeing this in action at Lovely Lou’s house, I’ve put all the plastics (storage containers and children’s crockery, etc) in a bottom drawer in the kitchen. SBJ (now 22 months) gets great delight out of opening the drawer and fiddling around with things. He’s never made it to the pots and pans drawer next door! In our apartment, when we had even less space and even more floor-level drawers, I extended this to puting toys at the front of any shelves I didn’t want SBJ to mess around with. It worked like a charm. We have always struggled with having unlabelled bags and boxes hovering near the front door, full of things to give to charity or take to a special disposal place. But no more! Now, thanks to advice from Pinterest, we have boxes in the linen cupboard, labelled with common destinations (Freecycle, Salvation Army, Rag Bin, etc). It’s now easier to figure out what to do with unwanted items, and they end up tidily packed ready to pop in the car every few months – actually putting them in the car is the step I haven’t yet mastered, but even getting this far makes a difference! File your t-shirts. No, really. Do it right now. Actually, file almost all the clothes in your drawers. I first tried this before SBJ was born, inspired by Apartment Therapy (via Pinterest, of course) but it didn’t last because I never really got my folding technique adapted for filing in our quite shallow drawers, and I never successfully convinced my husband, so things slipped pretty quickly. It’s awesome, though, I’m convinced of that. I can actually see all my clothes in the drawer, which means a) I have been more ruthless about giving things away if I don’t wear them, b) I actually wear things that would otherwise languish forgotten at the bottom of the drawers, and c) I smile every time I open a drawer. When you organise a drawer, cupboard or shelf, don’t fill it to capacity. Other items will arrive one day, either when you acquire more or when you move things around from elsewhere. If you don’t want to have to solve a baking supplies logic puzzle every few weeks, leave a bit of space everywhere. It also looks nice for as long as it remains! Do you regularly throw out food from the fridge because you forget to eat it in time? Angela‘s genius solution to this is so simple and so effective: label the side of each container with a little sticker saying what’s in it. It took me a while to really get how good this was, but I’m a convert now. Even if you could see that there was an avocado in there without one, a label saying ‘avocado’ suddenly makes it more likely you’ll enjoy the last quarter of that delicious avo today rather than cursing the mouldy remains as you throw it out next week. Keep a little box of sticky labels and a pen somewhere very close to the fridge – maybe on top, maybe stuck to the door of the fridge. Go on, put labels on your shopping list now if you don’t have any in the house! It’ll save you heaps of money and frustration. Do you want to squeeze more into your pantry or linen cupboard? Let me introduce you to a new friend of mine, the undershelf basket, and its cousins, the folding shelf and the plate stacker. 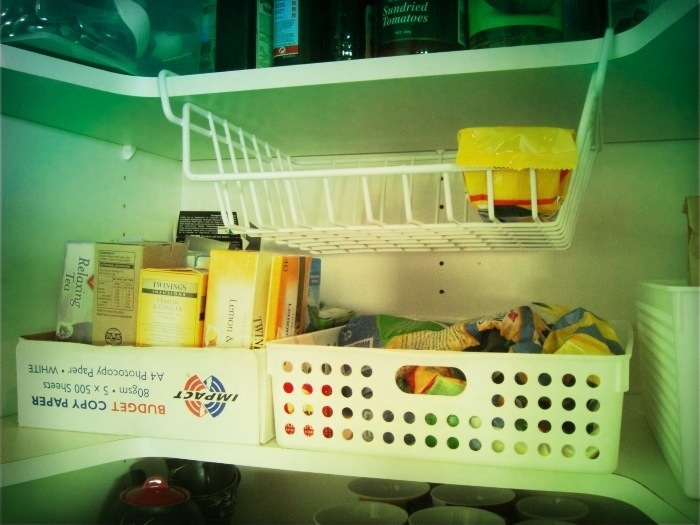 If you have a shelf full of low items like cans or spreads, you can use the otherwise wasted space above them by using an undershelf basket for very short things, like crackers or baking paper. I got this idea from Pinterest, and it hasn’t come to full fruition because the only ones I could find anywhere at the time have a slight lip, which makes the contents slightly more hidden and slightly more fiddly to get in and out than I’d like – but I have a very high standard of laziness when it comes to such things, and you might love them. Anyway, I still use them and think they’re worth it. I did just spot some without the lip at the Japanese shop on Cuba Mall, for keen Wellingtonians. At the moment I have one in the pantry, currently for rice crackers (a staple in our house), and two in the linen cupboard, for small things like face flannels and bibs. Anywhere that sells such miracle storage solutions will have a range of other brilliant ideas, too – thank you, kind staff at Storage Box (Monique at the Marion St shop was particularly lovely. She was great with SBJ – can you imagine a toddler in such a shop? – and she even carried bags of stuff down the street to our apartment lift one time). 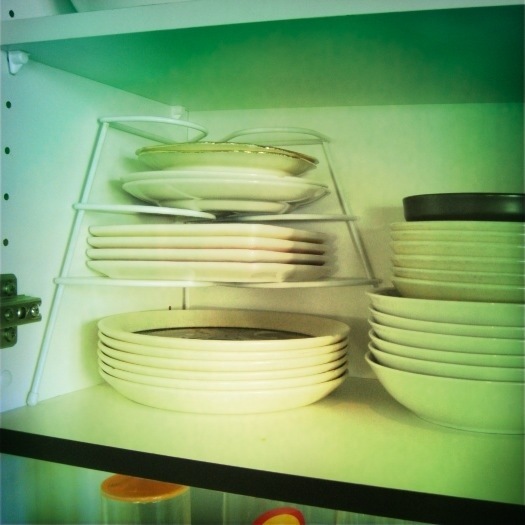 For our little apartment last year, along with the undershelf baskets, I got several plate stackers and folding shelves to maximise the kitchen storage while also keeping things easy to reach. I have trouble with my arms and hands, so can’t just stack plates and bowls up as high as they’ll go and lift the pile up each time to get what I want. Your Nana’s traditional corner-tiered plate stacker deserves a huge comeback. You can use the space all the way to the top of each shelf or drawer but still easily access whatever you want. It’s basically using the power of levitation. Awesome. Similarly you can get little folding shelves that do the same thing for other items. We have one in the pantry and one on the bench-top at the moment, and used them in cupboards for glasses and cups in the apartment. Ours were really cheap and tend to bend under the weight of anything more than, well, air, so if in doubt, I’d recommend going for the next model up which is stronger and more stable. If you have matching sheet sets, keep them together, and somehow distinct from all the other sheets. We have four or five sets of queen sheets (for two beds) that are all shades of cream. That was my first mistake. They’re different enough that they’ll look a bit odd mix-and-matched on a bed, but similar enough that they’re really hard to match by the light of the hall lightbulb if they’re all mixed together in the linen cupboard. Pinterest (actually, Martha Stewart!) recommends keeping each set inside one of the set’s pillowcases, which is clever, but actually too much faff, and not pretty enough for me to try more than once. I read someone else recommending sewing colour-coded tags on the end of each sheet, so that would be pretty but is way over my head in terms of effort (see above on the high standards of laziness). Following Lois’ example, I keep the spare bed sheets in the spare room, away from the other linen, which makes it much easier, I haven’t got the sheets organised after unpacking yet, but I think I’m just going to keep all the usual sheets in the room with the bed they go with, rather than all in a cream lump in a cupboard. With fast-growing kids, it’s a weekly occurrence to discover that something doesn’t fit anymore. It’s great to have a proper place to put the outgrown onesie, and somewhere handy and effortless. I don’t need to get out a box of organised clothes from the attic – that can wait to be done every few months – I can just stuff it in a drawer to think about later. Do you, like me, struggle with all the little bits and pieces that don’t quite have homes and just sort of swirl around the kitchen benches looking untidy while you decide what to do with them? Thanks again to Pinterest, I have a brilliant solution for you: get a hanging pocket organiser to hang on a wall, or even better, on the inside door of a cupboard, out of sight. Mine has pockets labelled things like ‘broken’ for things that I feel like we should fix one day rather than throw out but I’m definitely not going to fix anytime soon; ‘misc tech’ for memory sticks and other little techie things I come across; ‘tubes’ for lip ointment and Bonjela that have come out of someone’s pocket or bag; and ‘vouchers’ to try and curb my terrible habit of ‘saving’ vouchers for a rainy day that never comes until they’ve expired. This is basically a junk drawer, but categorised, tidy and out of the way. You could also do it by getting some drawer dividers (like for a cutlery drawer, but for stationery) to make your junk drawer a little less junky. So, what’s number 12? Give us your best ideas for getting the most out of your home. I’ll do a (rather shorter) housework and housekeeping version of this soon, so save those tips for then, but go wild with your organising and decluttering solutions in the comments below, please! This is part of a series on recategorising housework as a sacramental activity, somewhere God can be keenly experienced. The first post pairs a Joy Cowley Psalm with a piece from the book of Proverbs; the second is about the power of doing someone else’s housework; and the third challenges the view that Jesus was dismissive of housework when he visited Mary and Martha. See the whole series list here. There are plenty of ways to join the conversation and keep in the loop. You can get emails whenever there’s a new post here by signing up at the top of the right-hand sidebar, and/or also follow me on Facebook (for extra links and resources, daily), Pinterest (for link-plantations including for this domestic genius wannabe) and Twitter (for ranting and raving). Dear Thalia. I adored you anyway, but this is the icing on the cake. Thanks for this fantastic list – some things I already do a version of, but others here are going to revolutionise my life in the days ahead. Between you and the recent Sponge post about a clear house, I am feeling inspired and resourced. It must be in the water! Great tips. Yes, I’ve left a comment on yours, too! Everyone should head to Angela’s list! Hey! I left a post that’s disappeared! Anyway I was just thanking you and The Sponge for inspiring and resourcing me: wonderful. Some great ideas here Thalia! What are your best tips!? Great post Thalia – I’ve inherited the ‘clutter’ gene from both parents so need all the tips I can get I’m short on kitchen storage so one thing I’m about to try is using a bread ‘box’ (with roller lid) on the bench to store things like serviettes, straws & other odd bits. I’ve also recently bought a flexi-tub to hold my plastic containers (though I still have to dig for lids!). Some great tips – I’m off to buy a wall hanging organiser now! Thank you for filtering Pinterest for me – I have no patience for that website, but don’t deny that there are some useful tips on there! If anyone has a neat solution for the thousands of bits of “artwork” that accumulate in my house every day from the girls, I’d love to hear it – they definitely cause the biggest clutter problem. I think my biggest tip is to find a space for the stack of papers that come in the post (bills, bank statements, letters etc) – I think it’s inevitable that they end up in a pile somewhere and ours used to accumulate on the kitchen work surface. We’ve now made some space for the pile on a shelf by the kitchen that’s a little hidden away, so they go on there until we’re ready to deal with them / tidy them away. It makes a big difference to have somewhere to put them. There’s no way scanning would work for me either, but what about just taking photos? There’s only one piece a year that would be so stunning you’d want to do more than that. Then into the recycling bin after one week on the fridge/display wall? Sorry, posted this reply to the wrong comment – see below! For my kids’ artwork and school work, I keep a couple of plastic storage cubes (stackable) in a cupboard. We keep the exceptional work, and recycle the rest. I’ve taken photos of some of it too. I spotted Angela already suggested the scanning artwork trick over on her blog – I’ve been meaning to do this ever since the work started appearing, but it seems to be above my laziness threshold! I just never get round to doing it! Ooo inspired by this, I’ve started writing what’s in the fridge directly on the front with a whiteboard pen. It’s not pretty but reminds us all what left overs are waiting to be gobbled. I’ve also starting doing my shopping list like this on the fridge. Well done, Rochelle! How’s it going? We do that, with a list on the fridge door also of what’s in the (separate) chest freezer. It helps to identify what needs eating next, and informs the shopping list. Love your tips Thalia, I ditto so many of them myself living in our little Apartment. 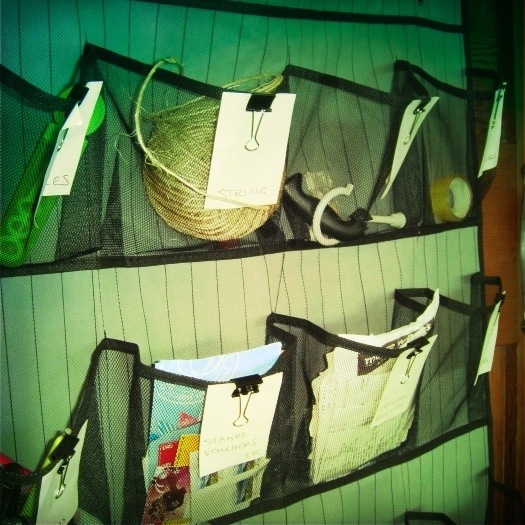 I especially love your #7 Undershelf baskets…I so need to get us some of those babies. Katy above said there are some good undershelf baskets at KMart and I spotted some good ones at the Japanese discount shop on Cuba Mall too. My nemesis was always the plastics cupboard- finding a lid for a container was so much hard work! I don’t like to store each lid on its container as they so easily get a bit funky inside and it takes up more space. Then I hit upon the idea of storing them in a set of little crates- all the lids in one crate and all the bottoms in another. I still spend a while rummaging to find a container and lid, but at least know where to look and can pull out the crate to look with more light if necessary! I appreciate that there is a post on this, so much of this type of work fills our lives/falls on our shoulders as mothers, but not many people even mention it! I tried the big/small drawer idea.,,, but didn’t figure that my youngest may be more interested in her clothes than my boys were/are, and it has been a bit of a battle to keep her out of the ‘too small and too big drawers.’ I thought ‘back of drawer’ or ‘top drawer’ might have worked, but narp, she grew. So need some sort of inaccessible (but accessible enough for me to use it) system. Box under the bed worked until it was full, I think I need to sort into ‘nice to pass on’ and ‘only for people who understand that you need ‘kindy clothes’ at the point of putting them in there, that would save the big sort outs later on.